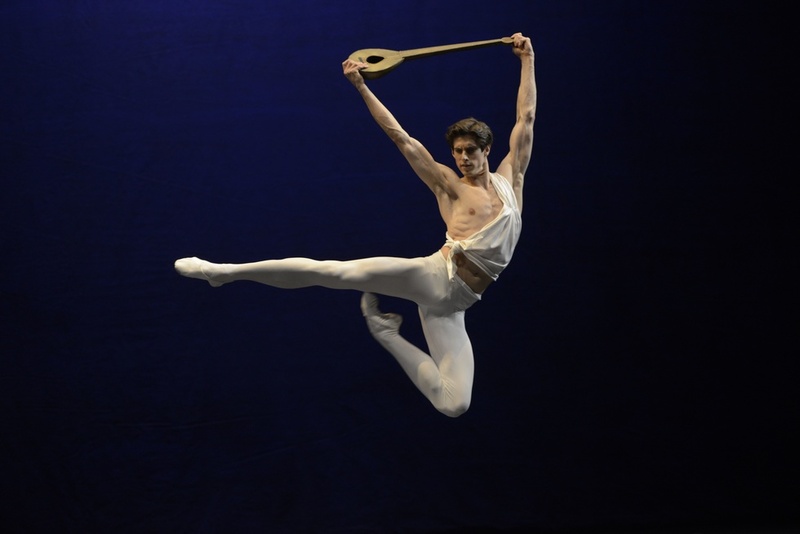 Xander Parish in Balanchine's "Apollo." Photo by Valentin Baranovsky, courtesy Mariinsky Ballet. What do you enjoy more: performing or being in the studio? Performing. My coaches understand that I'm not a studio dancer—sometimes, in the studio, it can go quite horrendously. They'll say: It's okay, we know onstage you can do it. In reaching the top, how much was talent and how much was sweat? A lot more sweat than talent. I've got certain attributes: long legs, nice feet. That's a blessing, but I wasn't naturally coordinated. I was called Bambi in school because I couldn't really control what I had. I was a very late developer: I got my strength together when I was maybe 27.
Who is your toughest critic? Probably Yuri Fateyev, my boss! In the best possible way. Sometimes I feel like I've done my best, couldn't do any more, and he's not satisfied. He wants more, so I try to find it. When he's pleased, at least you know you've earned it. Parish in "Swan Lake." Photo by Natasha Razina, courtesy Mariinsky Ballet. What is your favorite thing about life in Russia? St. Petersburg is such a beautiful city—it's like being in a living museum. Every street has its own history, the canals are like Venice, and the museums are incomparable. What's the most difficult part of learning Russian? The grammar. I was never very good at languages, unfortunately. I can hold a decent conversation, although I wouldn't say I'm fluent because I have some pretty large gaps in my grammar. Probably chocolate: My mom sends me tons of Green & Black's chocolates, a nice, organic brand from England. Otherwise, I'm saving for an apartment in St. Petersburg, so I can't waste my cash. Parish with Viktoria Tereshkina in "Romeo and Juliet." Photo by Valentin Baranovsky, courtesy Mariinsky Ballet. Do you have a talent that few people know about? I'm kind of a hotshot at table football—I'm the reigning champion at the Mariinsky Theatre! We play all the time between rehearsals. Have you had a worst nightmare onstage? Oh crumbs, how many? Back at the Royal Ballet, I was doing the corps in Sleeping Beauty, and somebody managed to trip me over. I couldn't put my hands down because I was holding a garland, so I fell over in the middle of the stage and dislocated my shoulder. I had to knock it back in its place and keep going. It was rather unfortunate. What qualities do you admire most in other dancers? I greatly respect the tenacity and dedication of my colleagues in the corps de ballet. These guys—I don't know how they do it. They do 40 shows a month sometimes, and I'm not sure how they're still standing. It's remarkable. Parish in "Apollo." Photo by Valentin Baranovsky, courtesy Mariinsky Ballet. Of which accomplishment are you most proud so far in your career? I think to be one of the first foreigners to join the Mariinsky. It took a leap of faith and jumping into the unknown. I'm glad I did it —everyone thought I was nuts at the time. In some small way, I've changed the thinking about what is possible in the ballet world, which is cool. What advice would you have for students wanting to be professional dancers? You have to have your head in the game, with no distractions. If you want to succeed, you have to invest yourself 100 percent, now. There's no alternative. You can have fun later, but you can't invest yourself later. When I first joined The Royal Ballet's corps, I felt very intimidated. I told myself that, one day, I would try to make every dancer who is younger than me feel welcome in the company where I'm working. I hope I'm remembered for making people feel comfortable and valued. In a company, we're a team.